I’m all for chasing rabbit trails and chapters 4 & 5 of Paddle to the Sea offer such an opportunity. 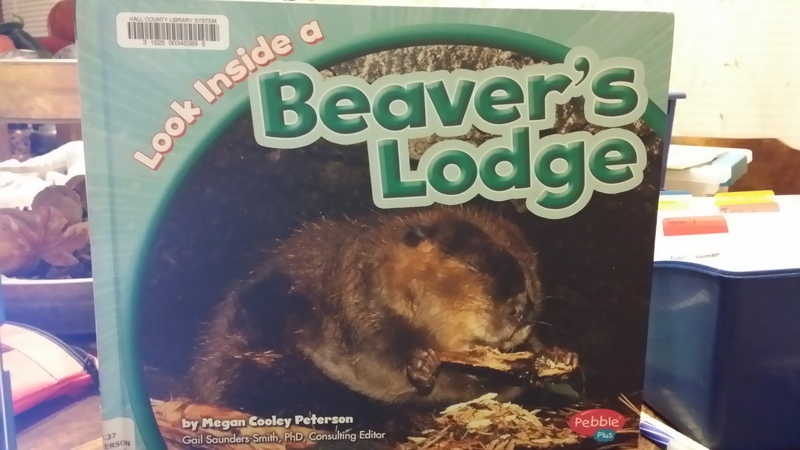 We learn in chapter 4 that Paddle gets caught in a beaver dam. 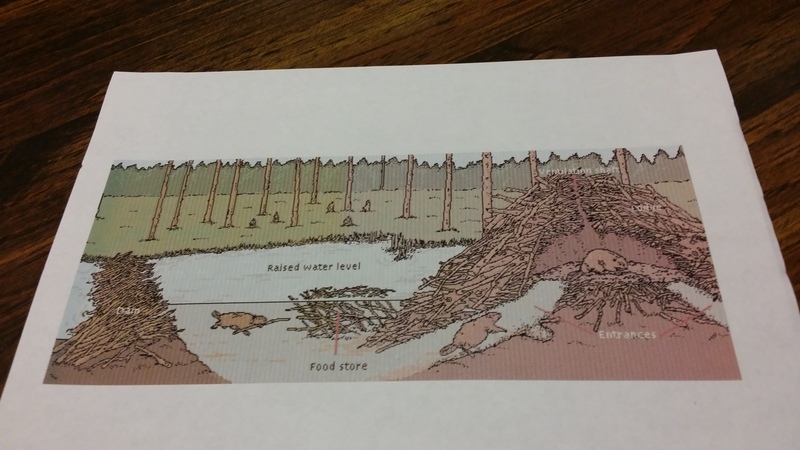 We are treated to a wonderful illustration of a beaver pond and its wildlife. Chapter 5 sees Paddle sent off as the beaver dam burst from the mass of water sent by the melting snow. We checked out three books from the library but only used one. 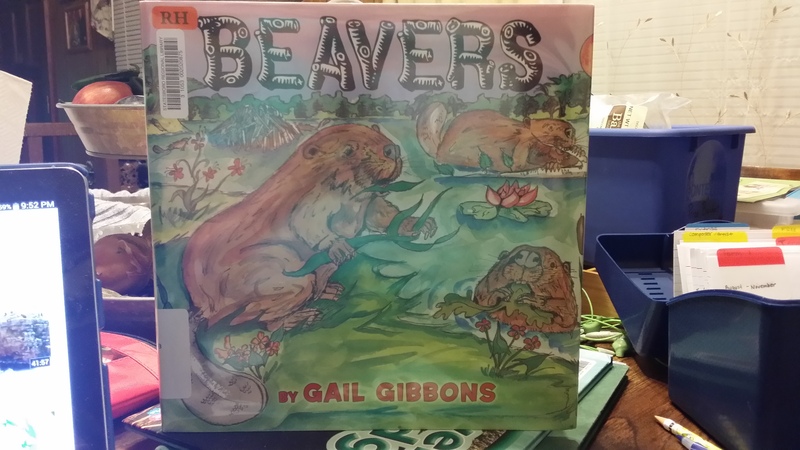 It is from one our favorite non-fiction authors, Gail Gibbons. We use a ton of her books. This time her book was the main book. The other two books are good and would have been used if we had not watched a video first. More on that in a bit. 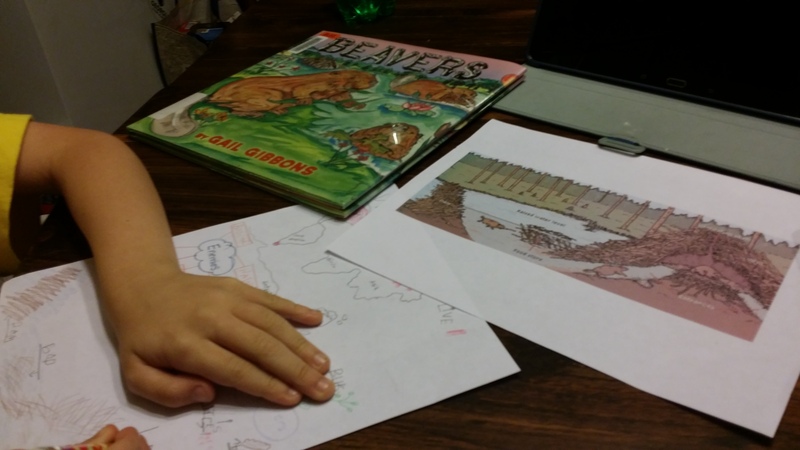 We used Gail Gibbon’s book, Beavers, as a guide for our science journal page. 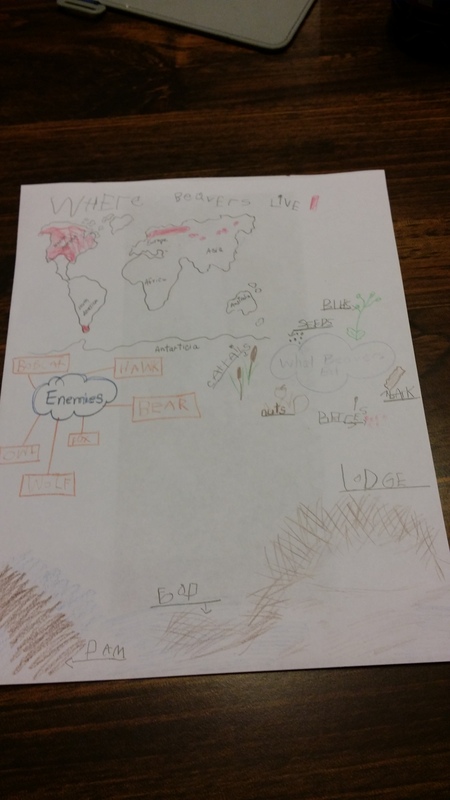 I traced the map from the book for him since it was hard to see. 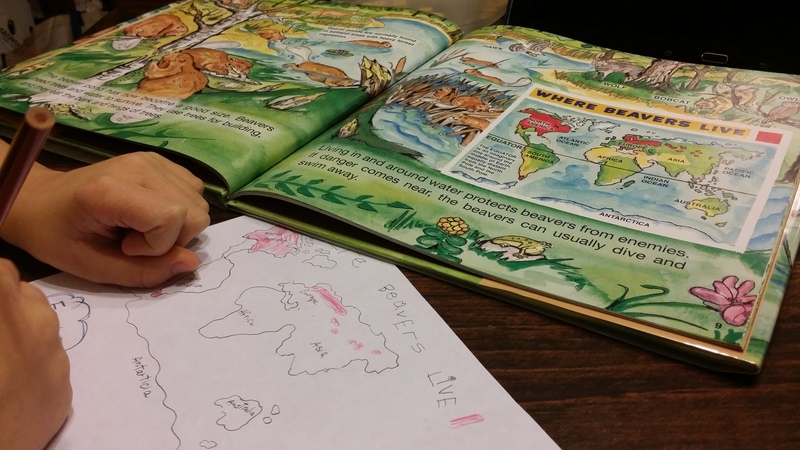 Then he used the map in the book as his guide to coloring in where beavers live. Next he learned about their predators and what they ate. He wrote the predators down but drew the food. Next with a bit of help, he drew what the beavers build. We did this after watching a video, so I had him tell me about each one as he drew them. I was surprised what he narrated back because he was so fidgety during the short video. Here are a few shots of him doing his work. I also had a print out handy but we did not need it. This video by the BBC is the one we watched. Not as detailed as the other but it fit his attention span well. 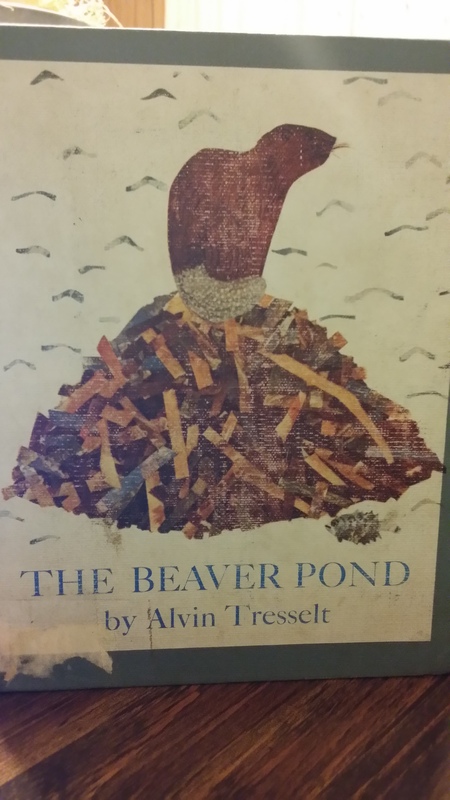 I wanted to have him make a make a beaver dam but I could not find any material I was happy about. I think he got the information just fine any way. I also had bought a river/pond tube from Hobby Lobby that had a beaver in it just so we could use it with the project. That didn’t work out but it is nice to have to look at. I would like to find someplace (maybe a state park) that a beaver dam. I’ll have to keep working on that. We were both fascinated by the fact that a beaver’s teeth are always growing and he keeps them trimmed and sharp by chewing on the trees. The video was neat because it compared how a beaver works to how a builder builds a log home.